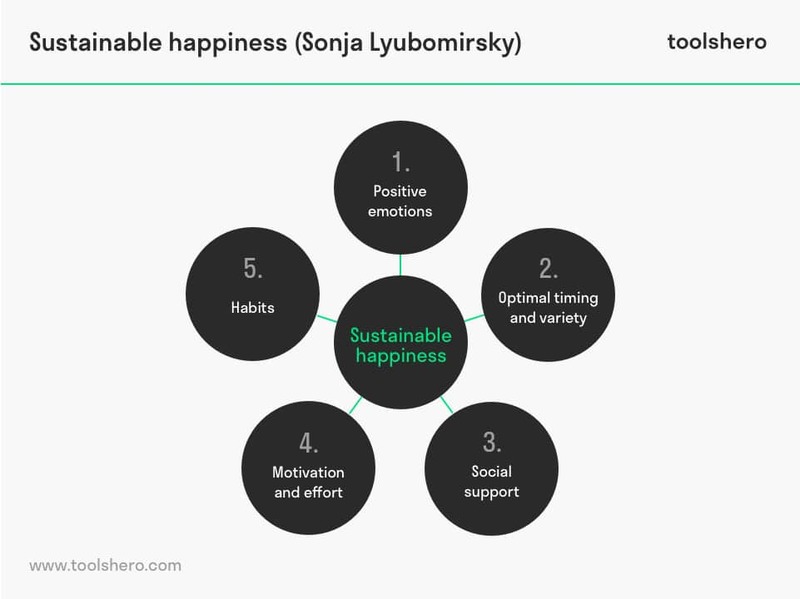 This article explains the Subjective Happiness Scale, developed by Sonja Lyubomirsky in a practical way. After reading it, you will understand the basics of this powerful Personal Happiness theory. In this article you can also download a free editable Subjective Happiness Scale template. What is the Subjective Happiness Scale? In her book ‘The How of Happiness‘, which was published in 2007, psychologist Sonja Lyubomirsky describes ways to measure subjective happiness. This is the Subjective Happiness Scale or SHS. According to this Subjective Happiness Scale the 40% formula applies, in which 50% of your potential happiness is determined by your genes. The other 50% is divided into 10% and 40%, 10% of an individual’s happiness is related to their life circumstances and the remaining 40% is due to the conscious choices they make. For example, self-control can make all the difference. Lyubomirsky has also written a follow-up book that consists of 12 happiness-enhancing strategies. Lyubomirsky ‘s book is a self-help tool that enables people to learn strategies to boost their happiness. She aims to show that happiness in life is largely determined by people themselves and that they themselves can undertake things to boost their personal happiness. First of all, the current level of happiness has to be determined; this is the starting point of Subjective Happiness Scale (SHS). By using clear strategies, the feeling of happiness can be boosted and people learn to let the feeling of happiness continue. It would be preferable to tailor the specific exercises to each individual that suit their character, personal goals and living conditions. Some people are generally very happy; they enjoy life regardless of what is going on, getting the most out of everything. To what extent does this characterization describe you? Some people are generally not very happy. Although they are not depressed, they never seem to be happy as they might be. To what extent does this characterization describe you? The scores of the four questions are totalled after which the outcome is divided by 4 and this provides the SHS score. Most people score between 4.5 and 5.5. With a score lower than 4.0 it would be advisable to take a depression test or seek the advice of a mental health professional. The forty percent formula finds its source in the basic level of happiness. 50% of happiness is based in our genetics. Depending on the situation or the shape of the day, there are moments that a person is happy and there are moments that a person is unhappy. People always return to this basic level of happiness, regardless of whether they are dealing with favourable or less favourable living conditions. That happiness is genetically proven, is evident from, among other things, twin research, genome research and brain research. It turned out that identical twins who were separated at birth experience a similar level of happiness at a later age. Furthermore, there is a hereditary depression gene that makes people prone to depression. Finally, brain research shows that there is an area in the brain that is dedicated to the processing of positive emotions; the prefrontal cortex. This is also a genetic factor. 10% of happiness is affected by living conditions. That does not seem like much but research has shown that living conditions are only a small determinant, and that, for example, rich people are not happier than poor people. The circumstances, including work and income, living environment and health, have a limited influence on happiness. Material goods bring only a short-term and temporary happiness. Research has also shown that 1/3 of very wealthy people think that money causes more problems than it solves. Being beautiful does not make a person happy all the time either. There is, however, a connection between a positive self-image and feeling happy. Happy people have a more positive outlook on life. Yet the feeling of happiness can fade away again, because people get used to it. This is a process which is referred to as hedonistic adaption. Incidentally, this also applies to unpleasant things that people can get used to, such as illness or disability. 40% is determined by the conscious choices that people make, whereby self-control can make the difference. Within this 40% there is space to create more individual happiness. It is about how someone thinks and how they behave. A person can raise their level of happiness by eliminating certain things that block their happiness by not focusing on them. For example being dissatisfied with their job, appearance, an unhappy marriage and so on. By adopting the mindset of happy people, a person will be able to become happier themselves. The stream of positive emotions that people experience on a daily basis, should not be underestimated. They give people a considerable boost, help break a downward spiral and promote blood vessel and heart health. Positive emotions also make people smarter and more creative. Optimal timing is important when applying a happiness strategy. It is also important to vary strategies so that people do not settle into routines. By doing various happiness activities at the same time they keep variety alive and fresh. The environment can make a positive contribution to someone’s feeling of happiness. Interactions with people in the environment provide motivation, support, encouragement and validation. These people could be acquaintances or like-minded individuals. The focus on something new requires effort and motivation. By effort is meant that people need to put in effort and sustain that effort, not just the once but continuously. This will no doubt lead to demotivation. In that case motivation will have to be given a boost and the person in question should have a clear idea what the ultimate objective is of their efforts. Habits are difficult to unlearn and new habits are difficult to learn. Practice makes perfect; by repeating and making an effort, a new habit will become more ‘normal’ so that it will have the desired result. Before people get started, they must first distance themselves from their assumptions about what makes them happy. People often focus on the wrong things such as image and living conditions, whereas the true sources of personal happiness and well-being are more obvious. It is therefore a good idea to find out first what causes discomfort. Why is someone feeling unhappy? Then they need to find out what their strengths are. By doing the things they are good at they can use them better and do them more often. Finally, their own lifestyle is important. People may wonder whether what they do, happens naturally, or whether they do this to please someone else. They can also do something based on their own conviction, from a sense of guilt or because the environment forces them to do so. Anyone who wants to become happier, according to Lyubomirsky, will have to invest in themselves. With happiness-enhancing exercises, people are able to elevate their level of happiness beyond the natural set point of happiness. It means that people will have to change their lives radically and adopt a different attitude towards their lifestyle. In all cases it is about ‘boosting happiness’, which implies that an effort must be made. Measure your subjective happiness with the Subjective Happiness Scale template and get insights to reach sustainable happiness. This template is available for free as an editable Word file or as a printable PDF file. What do you think? Have you ever heard of the Subjective Happiness Scale? Do you recognize the practical explanation or do you have more suggestions? What are your success factors for personal happiness and well-being?